In the course of any guitarist’s life, there will be some point where they come into contact with a product manufactured by Peavey. And if that 80s retro logo, complete with pointy-angled letters, bestows itself upon your amp on stage it will either be a source of embarrassment or a badge of honor, depending on your design tastes and sound needs. While I took the logo off it long ago, I have owned a Peavey 1516 bass cabinet for 20 years and maintain a love/hate relationship with it. I hate it becase it weighs well over 100 lbs. and is a major hassle to move around. I love it because, despite all my attempts to destroy it—so a valid reason exists to buy a new, lighter cabinet—I simply have not been able to destroy the thing. In the 20 years I’ve owned it, it has been dropped down stairs, flooded, barfed on, spilled on, surged…you name it. But the thing simply will not go down. This cabinet is the “Rocky” of bass cabinets. A testament, in my opinion, to at least one era of quality and durability in their manufacturing culture. So where am I going with all this? My point is that, despite my flakey dislike of their logo and my shallow disapproval of their industrial designs, most of my functional experiences with Peavey gear have been good ones. Most recently, this includes their new audio interface called AmpKit LiNK and also the accompanying iPhone amp modeling app, created by Agile Partners, called AmpKit. It’s available for download starting today. 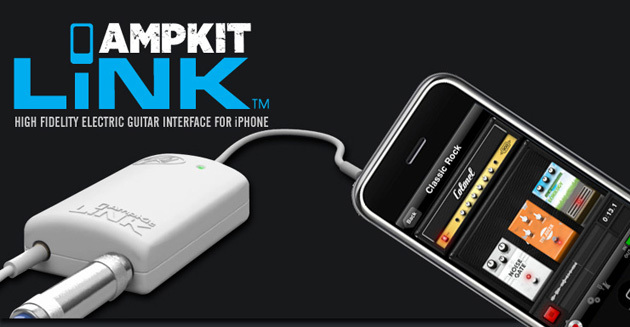 AmpKit and AmpKit LiNK work together to add another fine option for people out there looking to play guitar or bass through their iOS device (iPhone, iPad, iPod touch). I am going to note a few of the key features, pros and cons here but feel free to watch my inordinately long video review below, to hear how AmpKit sounds. The video will also give you a chance to appreciate the sweet wood paneling that envelopes the walls of the music cave to which I am relegated for these reviews. Enjoy. 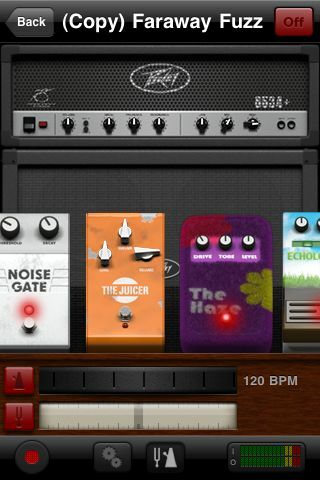 Re-amp is a feature of AmpKit that lets you simultaneously record your guitar/bass tracks with effects on and also with effects off. It actually stores a second “clean” version of the track so that after you finish recording, you can change the effects coloring the guitar tone as often as you like. This way, you don’t have to worry about trying to click any virtual pedals on the iPhone during the act of recording. You can instead take care of that afterward. A great idea indeed! Another key feature is its high volume simulation. 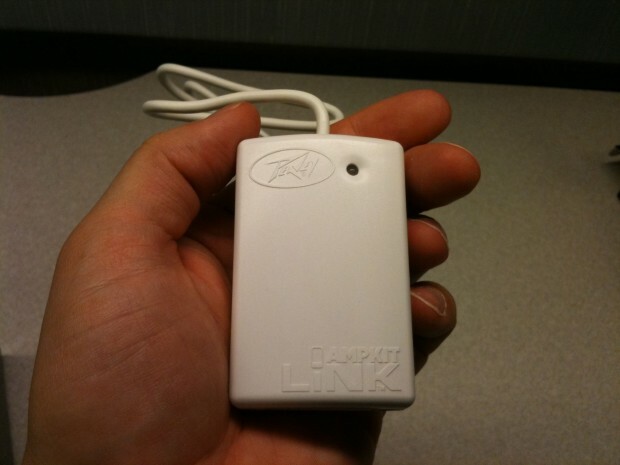 The circuitry of the AmpKit LiNK is powered by two AAA batteries and, according to their documents, this is what allows the device to simulate their high volume amps, accurately, without headphone feedback. I was still able to get the thing to feedback once or twice, while I was goofing around with the noise gates! YOWEEE!! Sounds – AmpKit’s guitar tones are great! From crushing distortion to kooky tremolo, there are many tones to choose from and it is easy to navigate through the options with speed and efficiency. Component choice – There are also many different virtual component configurations you can set up with the software. I didn’t count them myself but according to their spec sheet, they will have 49 components available at launch: 12 amps, 16 pedals, 13 cabinets, and 8 mics. Practical UI – This app definitely passes the “master-it-in-about-5-minutes-without-reading-the-manual” test. What it lacks in super detailed graphic design, it makes up for with intuitive usability. Handy import/export – This feature lets you easily transfer your own backing tracks into the software, so you can play along. It just as easily lets you transfer recordings off your iPhone and onto your computer. Robust Help section – The Help section is complete and useful. This is often an overlooked or under-delivered feature of many iPhone apps. Cheers for this attention to detail. Tuner and metronome – A must for any personal amp app. Multiple price points – The basic version of AmpKit will be free, with a limited number of components available. There will also be a premium version called AmpKit+ that comes stocked with more virtual equipment. The beauty of their built-in component store though is its “a la carte” system for purchasing new virtual gear—one component at a time. It mimics the app store concept for micro purchases and therefore lets you ease into more virtual equipment while easing the strain on your wallet. A nice touch. Needs Batteries – While they serve a good purpose in the feedback canceling scheme, you still have to have them on hand to use the combo. Also not a big of a deal, but something to note. AmpKit LiNK is available from Peavey retailers worldwide for $39.99. An order form should also be available at Peavey.com soon. AmpKit+ is $19.99 (the included gear in this version equates to a more than 50% discount over the same components purchased individually). AmpKit sounds good, is easy to use and is full of options. Paired with AmpKit LiNK, it is a fine, portable studio for guitarists with a couple of options for bassists too. Pricing seems consistent with competition. More info at Peavey.com and Agile Partners’ site. Available in the iTunes app store.